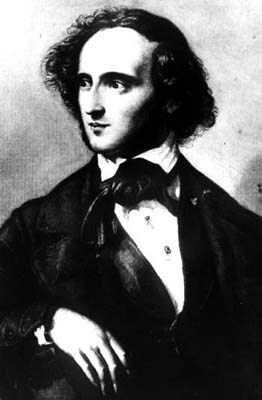 Felix Mendelssohn was born Hamburg on the third of February 1809 the third of four children in a successful banking family who were also distinguished intellectually and artistically. His family converted from Judaism to the Lutheran church in 1816, and at this point adopted the additional name 'Bartholdy'. The conversion was almost certainly done to gain social acceptance rather than for religious reasons. Felix himself never used the adopted name. In his childhood he studied the piano with Ludwig Berger and theory and composition with Carl Friedrich Zelter. His talent for both performance and composition was prodigious, and his first surviving compositions date from 1820. His first symphony, which he wrote around the time of his fifteenth birthday, should be more precisely called his first orchestral symphony. He had already written thirteen symphonies for strings. It, along with the String Quartet in Eb major and the Octet, written in 1825, are the first works in which Mendelssohn's genius and emerging original style can be clearly seen. Mendelssohn's music is most clearly influenced by Mozart and Beethoven, and his use of form and harmony is rooted in the classical period. His extensive education also brought him in contact with the work of Bach and Handel whose distant influence can be traced in his use of counterpoint. From around 1824 he developed a characteristic style of his own, which places him clearly among the early romantic composers. His works are often programmatic in nature, with underlying literary sources, or descriptive of nature or emotions. The first symphony is built on a classical plan, very much on the model of Mozart, though with some of the drama of Beethoven thrown in. The two outer movements are fast and dramatic, and the two contrasting inner movements are a lyrical andante and a minuet and trio. The first movement is in sonata form and is constructed on a large scale. The musical material contrasts a dramatic stormy opening idea with a calmer more lyrical second theme. The impetus of the music is never lost and the movement surges on relentlessly to it's dramatic ending. The slow movement is a simple and lyrical andante based on a flowing legato melody accompanied by a syncopated figure, which is elaborated as it is passed round the orchestra. There is one declamatory outburst, which only briefly disrupts the mood of tranquillity. The third movement, a minuet and trio, makes one dramatic break with the past in that it is written a compound time signature (6/4) which has two beats in the bar rather than the traditional three. Clearly Mendelssohn did not expect anyone to dance to it. The minuet is perhaps the most original movement of the symphony and has many elements of his mature style. It is based on a dramatic theme, which has drive and energy and is immediately appealing to the listener. The trio is simpler and much gentler. It is linked back into the minuet with a short dramatic passage reminiscent of Beethoven. The final movement is in sonata form and is based on two contrasting ideas. The first having fast running semi-quavers and dramatic contrasts in dynamics. The second is begun by quiet pizzicato strings, which are joined by the woodwinds playing a simple legato melody. The development section introduces a fugal idea that is built into a long and complex contrapuntal section. At the end of this the fugue subject is cleverly interleaved with the opening semi-quavers building to a climax that presages the blazing recapitulation. Mendelssohn’s short life was one of great fame and happiness. He gained an international reputation as both a pianist and composer, becoming particularly popular in England, where he was entertained by Queen Victoria and Prince Albert. His marriage to Cécile Jeanrenaud in 1837 was the beginning of a very happy partnership and a family of five children. He was an accomplished painter in water-colour, and a witty letter writer. Sadly his health was not good and towards the end of his life he suffered from vascular problems. He died after a series of strokes in Leipzig on the 4 November 1847 at the tragically early age of 38. Mendelssohn's first symphony was performed by the Portobello orchestra on the 1st April 2006. The conductor was Anthony Weeden.